What is Real Time Electronic Communication? 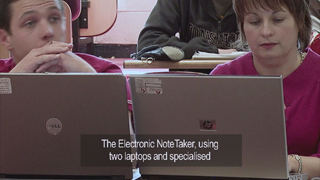 The communication Facilitator uses two networked laptops and Stereotype Software to provide this service. As the Communication Facilitator types the information into their laptop it is read simultaneously by the client on the second laptop. The resulting transcript can be used as reference material or notes. Edited, spell checked and quality assured. NoteTaking Solutions operators Rose and Liz have worked with me in my four years in Cork Institute of Technology where I studied for two degrees, -Civil Engineering and Construction Management. Working with them has been a rewarding experience. Rose and Liz have been efficient and professional, which has helped me to succeed in the Institute, for which I will be forever grateful.